Happy Wednesday! I hope you all have had an awesome week so far. Mine has been wonderful - it has already involved the new season of Sherlock, yoga in the park, an amazing BLT and a dog play date. I mean, that is good good, am I right? In other news, I am wearing my blue pants again. I am convinced these were the best Target purchase I have ever made (which is saying something... Target has a lot of my money!). I posted 4 ways to wear them last year, and it looks like I will have a whole other post coming soon. I love you, blue pants. And how cute is this little bow top from Instyle Essentials? I know I've posted about them before, but the shirts really do fit soooo well. And with that, my friends, I am out. This entire outfit is just so pretty! That cardigan and the bow blouse are perfect together. I was just wearing my black version of these pants yesterday and getting kind of sad that they'll need to be replaced soon; they are getting really worn looking because I wear them so often! Um....can we discuss that PERFECT bow top! I have been looking for one like that for forever! If you love it, keep wearing it! :-) I love your haircut. I love my InStyle Essentials Bow Blouse! I wear a bra size 36G so if it weren't for the fact that these are sized by bra size I could never wear a white button down shirt. Love yours with the cardi and perfect blue pants- and your haircut is so sweet! That is so awesome! Yeah, I have heard some of the same things with my friends who are *ahem* more well endowed than me. It's awesome that they make shirts especially for your bra size! It's the most awesome thing ever. But it's nice it works for you, too! So cool that we have different bodies but can wear the same thing and it will look good on both of us. What a great outfit! That cardigan is so cute and looks great with those pants! A good pair of pants are the besttt! I like that cardigan, too! I love being able to wear something many ways so the pants are a total win! I really like your hair in this pic! P.S. Where do you do yoga in the park? Is this like a class? Beautiful cardi, love the colors, looks great with the pants. Omgsh BLT's are my favorite--that makes any week great :) And you hair is beyond adorable--and perfect floral sweater for spring pretty lady! Love your new haircut!! Perfect for summer and it's nice to be able to do your hair fast :) Your blue pants seem like the perfect staple wardrobe item plus you look great in them! Win-win! love the bow top ! You look like such a stylish working woman! Love the blouse especially as that bow detail is so pretty. I finally got a pair of navy slim fit pants and can't wait to style them! 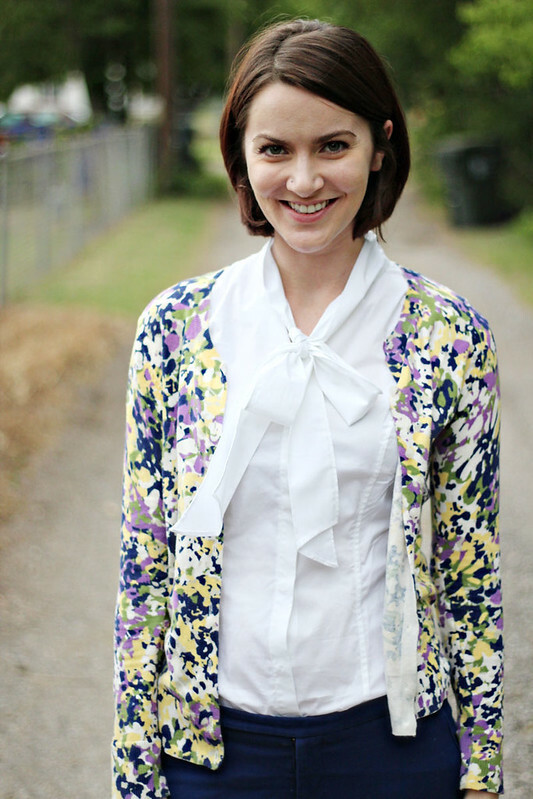 I love that cardigan and your pretty bow blouse! 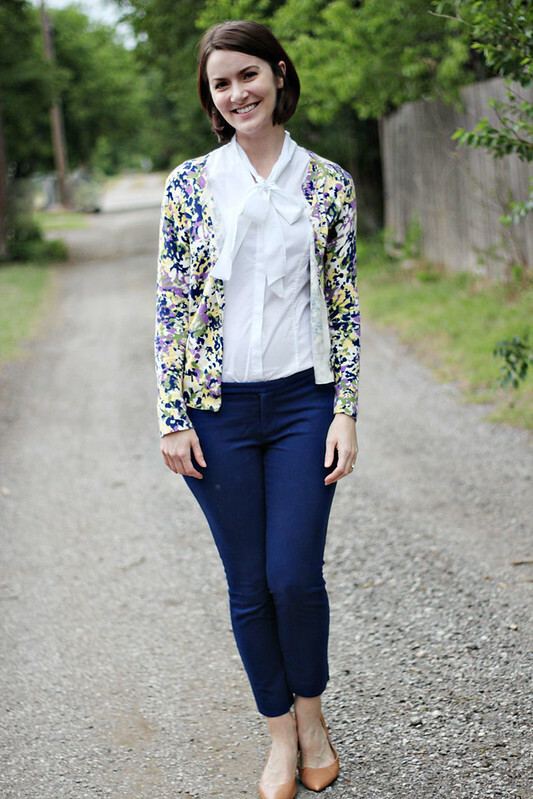 The floral cardigan looks great with the blue pants. It really lightens the outfit for summer. And I do like that bow. I have a dress and a sleeveless top with the 1960s-ish secretary type bow and it's always so fun. Plus you don't have to worry about a necklace. yay for blue pants! I just finished season 3 of Sherlock and now I'm impatiently waiting for season 4 to happen! That is such a cute blouse! It goes so well with that pretty floral printed cardigan, love it! Very cute outfit. It's amazing how versatile color pants can be huh? Your top is darling! Great outfit! The pants go great with that printed cardigan and that bow top is really cute! Love the color on those pants! That's great how versatile they are. Such a stylish work outfit! Every time someone asks me where I bought something I'm wearing, 95% of the time I say it's from Target lol. That store can do no wrong! The blue is such a great color! Love it when you have a go to piece you can wear so many ways! Such a cute look! That cardigan is so pretty! you look so wonderful and put together. the hair is the cherry on top. fabulous dahling. I love this cardigan! I can't believe it's from target..